Very hot water may just do the trick if the problem is grease clogging the line (A very slow draining time is indicative of a grease buildup in the pipes. Make sure the water is not boiling because it may cause the seals between the fittings or the drain to weaken or fail. It may take a few minutes for the water to work its way down so be patient. Once the clog is out, then run hot water for several minutes to wash out any more clumps of grease which may still be sticking to the pipes. If the hot water did not do the trick and you still have a clogged sink drain, then don’t immediately grab the store bought drain cleaner; it is harsh on your pipes,may burn your skin if you come into contact with it, it doesn’t always work and it’s expensive. Try a homemade solution using baking soda and vinegar and you will be surprised how well it works. It may take 30 – 40 minutes for the solution to work but when it does again use hot water to clear out the clogged sink drain completely. You don’t have to be a mechanical genius to clean out the trap underneath the drain. It is the “S” shaped piece under the sink and it is designed to catch solids that collect in the pipe before they go too far and cause a real problem. They usually open in one of two ways; either by removing a large threaded plug or by loosening up some couplers. Once you have access to the trap check to make sure it’s clear; water will flow out when you undo the connections so be careful. Small plumbing snakes that are hand cranked are not very expensive to purchase and may just do the trick. A snake is an object that has a long metal wire with some type of tip that bores when it rotates. The snake is used by inserting it into the pipe until it stops which is where the clog is. Once this is reached the idea is to spin the wire and it will bore through the clog. Be careful when using a snake because you can easily scratch the sink or damage the piping if not careful. 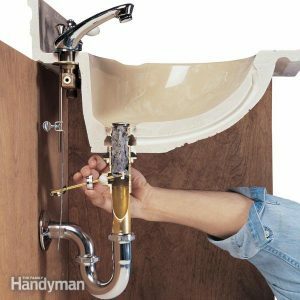 If all this fails then you might save yourself a lot of headaches and call a professional plumber to take care of the clogged sink drain. They can do it quickly, safely and at a reasonable price.